Located approximately 12 miles east of Exit 8 of the New Jersey Turnpike on business Route 33. From the Garden State Parkway, take exit 123 to Route 9 south for 15 miles to business Route 33 west. The Park is located 1.5 miles on the right. From the southeast, take Bypass NJ Route 33 west to the Wemrock Road exit. Turn right .4 mile to business Route 33, then left .25 mile to the park entrance. 16 Highway 33-BR, Manalapan, NJ 07726. The Park is open all year except for major holidays. Hours vary by the season. 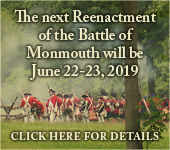 Call the park office at 732-462-9616 for more information. The visitor center and recreational facilities at Monmouth battlefield are partially accessible for people with disabilities. Please contact the park office for further information regarding disability access needs. The Carry In/Carry Out Program helps to eliminate trash by encouraging park visitors to be good stewards by placing their trash in bags supplied at each site and taking it home for proper disposal. Alcoholic beverages are not allowed in the Park. Park visitors are urged to employ caution and care when walking on the battlefield and do so at their own risk. Relic collecting and digging for relics are not allowed in the Park.